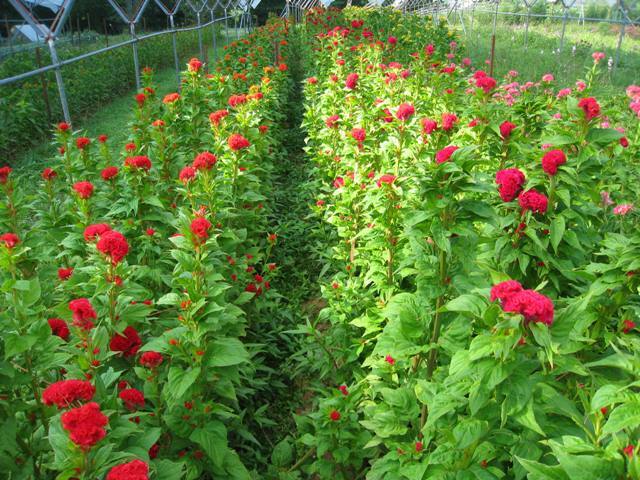 Summer is here for sure with Zinnias and new this week the beautiful Crested Celosia (crazy, felt like, “brain” flowers). Still plenty of Hydrangeas, both white and the brilliant Nikko blue. Betsy’s beautiful bouquets. Plenty of yellow Asiatic (non-fragrant) and fragrant Oriental Lilies in white and pink. Lots of late Dianthus, intense reds and purple/pinks. Might see the first of the big Lisianthus crop this week too. There is a growing supply of tomatoes with our new early red- Ultrasweet, Cherokee Purples and the great early season yellow/orange variety, Orange Blossom. A few German Johnsons and Italian Oxheart sauce tomatoes too. A few more Sungolds coming along. Still some Summer Crisp lettuce, for maybe two more weeks, that crispy sweet cross between Romaine and Leaf lettuce that is hot weather tolerant, in green dappled with Red and intense Red. A few more Cucumbers but they are slowing down. Probably the last of the spring Leeks. Some more Basil too. The first of our red onions even though they are very small this year, more like shallots. The aromatic, green fleshed Galia Melons are here this week with a bang, the heat must have really moved them along.